Public opinion outside of Europe is generally favourable toward the EU, but this is only partly due to the EU’s actions. How is the EU viewed outside of Europe? Bernd Schlipphak assesses public opinion toward the EU in non-European countries. He notes that for the most part citizens have favourable attitudes about European integration and the EU, but that the EU’s actions are only part of the explanation for these positive opinions. Attitudes are also strongly influenced by the extent to which individuals support the concept of international co-operation, with other international organisations, such as the United Nations, also benefitting from positive views of supranational decision-making. In recent years, a number of studies have focused on the causes of positive and negative public attitudes toward the European Union (EU) and the idea of European integration. This research has generally concentrated on the attitudes of citizens of EU member or European states. This is unsurprising, given that these citizens should be most aware of the EU and most affected by their actions. In contrast, very little analytical research has been undertaken regarding the attitudes of non-European countries. One might not be surprised by this state of affairs, given that the EU seems to have fairly limited influence on the lives of citizens in Latin America or Southeast Asia. Hence, there seems no need to move research into that direction. Or is there? What is apparent is that the EU is actually strongly – but often indirectly – shaping the lives of citizens all over the world. By negotiating free trade contracts which are often connected to the compliance of partners with a European understanding of regional integration, democracy and human rights, the EU not only influences national economies, but also the political conditions in which citizens in other parts of the world live. Additionally, the EU attempts to influence the everyday lives of citizens across the globe by means of Official Development Assistance. Such actions are enforced by the EU due to its self-understanding of being a soft or ‘normative’ power. Yet, what has only rarely been recognised is the fact that a soft/normative power needs acceptance on the side of recipients to be influential in promoting norms, ideas and values. From this standpoint, it is interesting to analyse first, how citizens perceive the EU in countries beyond European borders, and second, whether the actual behaviour of the EU (acting as a soft or normative power) has tangible effects on the attitudes of citizens around the world. Two projects have already attempted to answer the first question. Their descriptive results are confirmed by the data I have used for explaining why citizens beyond European borders are favourable or not toward the EU. All of the studies agree that a majority of citizens across the globe share favourable feelings toward the EU, ranging – with the exception of Jordan, Pakistan and Turkey – between 50 to 88 per cent of citizens having positive opinions about the EU. 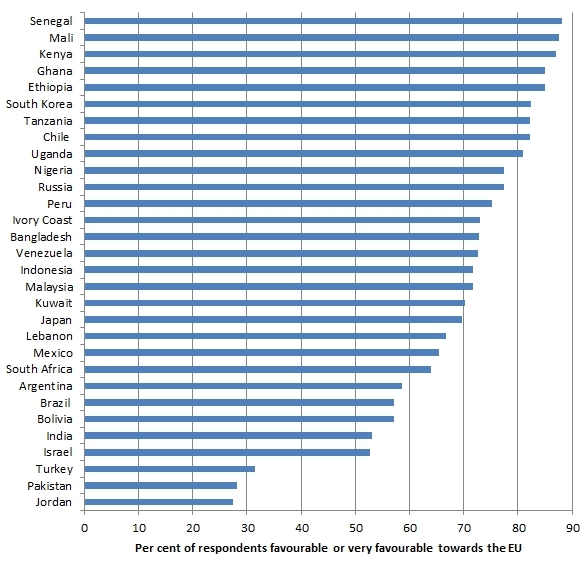 Figure 1 below illustrates the percentage of citizens holding favourable attitudes toward the EU in a number of non-European countries. Source: PEW Global Attitudes Survey 2007. Own calculations. Percentages are based on valid answers. Yet, one might wonder whether these attitudes are really informed attitudes: that is, if citizens know enough about the EU to properly evaluate it, or whether we are dealing with non-attitudes. Non-attitudes can be understood as an uninformed position which is arrived at by using proxies/heuristics (i.e. other attitudes connected to the question) or cues (such as the position of other trustworthy actors regarding the question). Given that little analytical research has been conducted into this issue, I take both assumptions – that citizens can evaluate the actual behaviour of the EU, or that they have to rely on proxies or cues – into account. However, given that even EU citizens are more often than not extremely uninformed about what the EU consists of and does, one would probably assume that the latter assumption is actually the case. One aspect that might affect attitudes toward the EU is a citizen’s general perspective on the concept of international co-operation. This incorporates views not just on the EU, but also other international organisations such as the UN, IMF and NATO. I argue that the extent to which a citizen is supportive of supranational co-operation strongly influences their opinion on distant and potentially unknown international organisations and their actions. I call this generally favourable feeling toward international cooperation ‘supranationalism’. Still, the actual behaviour of the EU might also (indirectly) have effects on the attitudes of citizens. Hence, I include context-level indicators into the explanation models which measure a country’s trade relationship with the EU, the colonial relationship of countries with member states of the EU, and the degree of Official Development Assistance which a country receives from the EU and its member states. To test my theoretical expectations I applied several regression methods on the basis of the individual-level dataset of the PEW Global Attitudes survey for 2007, which is generously provided to the public by the PEW institute. I added several context level indicators measuring the (potential) effects mentioned above. The degree of supranationalism of individuals was measured by their attitudes toward international economic cooperation between states, by their degree of education, and by their general trust toward others. I also controlled for several socio-demographic factors such as the religiosity, denomination, age and gender of citizens. The results show that both supranationalism and the actions of the EU matter for explaining the attitudes of non-EU citizens. Citizens’ attitudes toward international economic cooperation, as well as the degree of European Official Development Assistance and the kind of free trade relationship between the EU and a citizen’s country significantly and substantially affect citizens’ favourability toward the EU. Additionally, as I assumed that the same indicators should influence citizens’ attitudes toward unknown and distant international organisations in general, I tested whether these indicators also explain citizens’ attitudes toward the UN. Again there is evidence that they do. What are the implications of my findings? On the one hand, they provide a first attempt at explaining why citizens share favorable or unfavorable attitudes toward international organisations. On the other hand, researchers and practitioners dealing with the normative or soft power of the EU should also be interested in the findings as they demonstrate that the international behaviour of the EU does indeed – albeit alongside other factors – shape its image across the globe. For a full outline of the research covered in this article see: Schlipphak, Bernd (2013) Action and attitudes matter: International public opinion towards the European Union, European Union Politics. The author is furthermore happy to answer any questions on his (future) research on the topic. Bernd Schlipphak is a Junior Professor of Quantitative Methods at the University of Münster. His publications include Framing Ideology – die Kommunikation ideologischer Positionierungen zwischen Wählern, Parteien und Medien (Nomos, 2011). Turks cant favour EU after all those Double Standard policies, I am not saying at the moment Turkey can be EU member but at least EU shouldn’t lie and be unfair, EU should clearly announce if EU is a “Christian Club” or not, rest is solvable, otherwise don’t waste people’s time and energy.